The greatest of literary Frenchmen, the greatest man of genius whom this century has known, the Altissimo Poeta, the most splendid romancist of his age, has accomplished his great career. He was the last survivor of a great period in French literature--the last member of one of the greatest literary brotherhoods which has ever existed; and he carried with him to the very portals of the grave a lamp of genius scarcely dimmed, and a personal power and influence which every year increased. Not very long ago, all Europe gathered round him to offer congratulations on his hale and hearty old age; since then, with more than the hands full of flowers of the classic tradition, with honors and praises from every quarter of the earth, he has been carried to his grave. The very sight of a man so distinguished, the consciousness of his honored existence as the representative of the noblest and most all-embracing of the arts--that which depends for its effects upon the simplest and most universal of instincts--was an advantage to the world. The extravagances of hero-worship are inevitable, and in nothing is the ridiculous so tremblingly near to the sublime; but allowing for all that, and for what is worse, the almost equally inevitable foolishness which adulation creates, the position of Victor Hugo was of itself an advantage to the world. In a soberer pose altogether, and with a noble modesty which we may claim as belonging to our race, Walter Scott occupied a somewhat similar position--which would have been all the greater had he lived to Hugo's age, an element which must necessarily be taken into consideration; but, save in this one case, there has been no parallel to the eminence of the great Frenchman in the estimation of his country and of the world. It is not now that the critic requires to step forth to establish the foundations of this great fame, or decide upon its reality or lasting character. This has been done in the poet's lifetime by a hundred voices, favorable and otherwise; no need to wait for death to give the final decision, as in some cases has been necessary. It is scarcely possible to imagine that, after so long a time, any discovery can be made, or any change of taste occur, which would interfere with the supreme position of Victor Hugo. A new generation has been born in the faith which to their elders is a matter of assured and triumphant conviction. But it is a grateful office to go over again some of the noblest productions which human genius has ever given forth, and to contemplate in their unity the many works of a life as much longer than that of ordinary men as its inspiration was above theirs. It seems sad and strange, as well as laughable and ludicrous, that the great poet should be regarded by a vast number of his countrymen, and perhaps by the majority of the Paris mob which paid him the last honors in so characteristic a way, as a revolutionary politician and a democratic leader. We will take the privilege of the foreigner to leave out that side of his life as much as may be practicable. "Napoleon le Petit" and the "Histoire d'un Crime" are works but little worthy of his genius. Political animosities, sharpened by personal grievances, have in many cases an immense immediate effect in literature, but they pay for this easy success by speedy collapse; and scarcely even the magnificent rhetoric and splendid vituperation of "Les Chatiments" will keep them living when the world has forgotten the lesser Napoleon, as it already begins to do. His patriotic fury, the impassioned utterances of his exile, the tremendous force of feeling with which he flung himself into the struggles of France, took up a large share of Victor Hugo's life, and will procure him a certain place in the historical records of his period. But when all the commotion and the din have died away, as indeed in a great measure they have already done, these fiery diatribes, these burning lava-streams, will be of little more importance than the dustiest "memoires pour servir"--materials from which the historian, with much smoothing down and apologies for the pyrotechnics of a past age, will take here and there a vivid touch to illustrate his theories or brighten his narrative. They will retain, too, a certain importance as autobiography. But fortunately the great mass of the work which Victor Hugo has left behind him can be separated from the polemics of his troubled age and fiery temper. It is not in any sense a peaceful literature. Conflict is its very inspiration. The struggle of human misery with all the confusing and overbearing forces of life; of poverty with the requirements and oppressions of wealth; of the small with the great; of the people with tyrants; of Man with Fate--these are his subjects, and he is never an impartial historian. He is on the side of the weak in every combat, the partisan of the oppressed. But this does not detract from his work when his opponents are the oppressors of the past, or the still more subtle, veiled, and unassailable forces of Destiny. The poet's region is there: he is born, if not to set right the times which are out of joint, at least to read to the world the high and often terrible lesson of the ages. But it vulgarizes his work when he is seen, tooth and nail, in violent personal conflict with foemen unworthy of his steel, embalming in poetry the trivial or the uncompleted incidents of contemporary warfare. It becomes almost ludicrous, indeed, when we find him pouring forth page after page of vehement and burning complaint in respect to the personal sufferings inflicted on himself, when we know that throughout his career Hugo never knew what the cold shock of failure was, and that, from the moment when Chateaubriand adopted him into the ranks of the poets as l'enfant sublime, until the moment when all Paris conducted him to his last resting-place, no man has had a more enthusiastic following, or accomplished a more triumphant career. 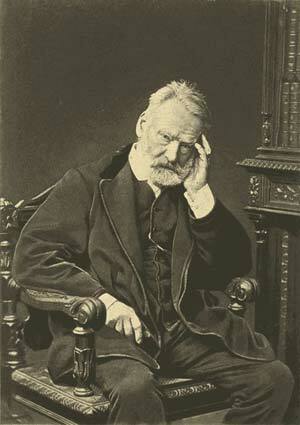 Victor Hugo was a son of the Revolution. He was born, as it were, between the two camps, at a moment when France was the theatre of the greatest popular struggle in modern history, of a mother who was a Breton and a Legitimist, and a father who was a Republican general--an extraordinary combination. This does not seem, however, to have made, as we might think, family life impossible, for Madame Hugo and her children followed the drum, and, notwithstanding all differences of opinion, found it possible to keep together. He was educated, it would appear, under his mother's influence rather than that of the soldier-father, and did not, till his mind was quite mature, throw himself into the revolutionary opinions which afterward influenced him so greatly. A Royalist in the Restoration period, an observant but not excited spectator of public affairs from 1830 to 1848, it was not till the coup d'etat and the beginning of the reign of the third Napoleon that he was seized with the passion of political life. That great betrayal seems to have stung him to a frenzied resistance and put poison in his veins. His country was cheated and betrayed; the liberty for which she had made so many exertions, both heroic and fantastical, taken from her; and his own personal liberty and safety threatened. Victor Hugo's soul then burst into feu et flamme. He caught fire like a volcano long silent, a burning mountain that had simulated quiet unawares, and clothed itself with vineyards and villages. In the tranquil days when Louis-Philippe plotted and pottered, and France lay dormant, amusing her restrained spirit with the outbreak of the romantic against the classical, and taking pleasure in the burst of genius which had arisen suddenly and unawares in her midst, the poet was so little dissatisfied with the bourgeois regime that he accepted the title of "pair de France." Montalembert had received it some time before. There must have been something soothing, not inharmonious to the poetical mind, in the slumbrous reign which gradually became intolerable to the commonalty and got itself into contempt with all the world. The young poets of the time were peaceful, not discontented. Full of energy as they were, they took no part in the gathering storm. Hugo, a peer, tranquil in the superior chamber; young De Musset, a courtier of the Duke of Orleans, and hoping for the king's notice of his verses. The eruption was preparing, the subterranean fires alight; but the sons of genius took no notice. When the tremendous awakening came, it must, in the case of Hugo at least, have gained additional force from the long restraint. He was in the height of life, a man of forty-six, the leader of the romantic school, which by that time had overcome opposition and won the freedom for which it contended, the author of "Hernani" and the other great plays which form one of his chief titles to fame, and of volumes of lyrics which had taken the very heart of the French people, and given a new development to the language. And it was also during this peaceful period that he had taken in another direction a first step of unexampled power and brilliancy in the romance of "Notre Dame." Even among men of acknowledged genius, few have done so much in a lifetime as Victor Hugo had done up to this break in his career. We are so accustomed to the attitude of demagogue which he took afterward, to the violent revolutionary, the furious exile, the denunciatory prophet of the "Chatiments," that it is strange to realize that his later aspect was prefaced by a long, peaceful, and prosperous beginning. France had never seen a more magnificent band than that which surrounded him, and which has made the reign of the Roi-bourgeois illustrious in spite of itself; and it is curious to mark that these great intelligences did not object to their ruler nor to his ways, but lived like good citizens, with but an occasional fling at semi-sentimental politics. Hugo was the champion of abstract right in all the discussions in which he took part. He it was who proposed, among other things, that the Bonaparte family should be permitted to return to France. Perhaps, had he been less abstract and logical, and more moved by the laws of expediency, it might have been better both for France and for himself. The plays which he produced in this time of prosperous calm and apparent peace are without question the most remarkable dramatic works of this century, and several of them will, we have no doubt, take their place permanently among the few of all ages and countries which the world will not willingly let die. While these plays were being written, and the mind of their author reaching its full development, the fountains of pure poetry, those outbursts of song which are often the most delightful and dear of all the utterances of the poet, were flowing forth, refreshing and fertilizing French literature, and giving a noble utterance to the new thought and rising energy of the times. His youth gave forth some uncertain notes, his fancy roaming from Bourbon to Bonaparte. But that his imagination should have been seized by the recollection of the great Napoleon is so natural, so inevitable, one would suppose, for every young Frenchman, and especially for the son of a Bonapartist general, that there would have been something lacking in him had he escaped that enthusiasm. Apart from these waves of national sentiment, and from the vague music of the "Orientales" and other such preludes and symphonies, there is poetry enough in the various volumes which followed each other at uncertain intervals, to have fully furnished one man of genius with fame enough for what we call immortality. Hugo has enough and to spare for all subjects that occurred to him. A sunset, a landscape, a love song, alternate in his pages with a philosophical discussion, or a brief and brilliant scene snatched from history, from contemporary life, from his own inner existence, all clothed in the noblest verse of which the French language is capable. His power over that language is boundless, the wealth of an utterance which never pauses for a word, which disregards all rules yet glorifies them, which is ready for every suggestion, and finds nothing too terrible, nothing too tender for the tongue which, at his bidding, leaps into blazing eloquence, or rolls in clouds and thunder, or murmurs with the accent of a dove. Never had there been so great a gamut, a compass so extended. It is not, however, upon his poetry, either in the form of drama, lyric, or narrative, that his fame out of France, or at least in England, is founded. There is no more usual deliverance of superficial criticism than that which declares French poetry in general to be either nought--which is still a not uncommon notion--or at least not great enough to be worth the study which alone could make it comprehensible. There are many good people who dare to say this, yet live, audacious, and unconscious of their folly. We have, however, to consider Victor Hugo on a ground which no one ventures to dispute. The great romances--for which we should like to invent another name--which we cannot call novels, and which are too majestic even for the title of romance, though that means something more than the corresponding word in English--are in their kind and period the greatest works produced in his time.